(1983) "I Want a New Drug"
(1984) "The Heart of Rock & Roll"
"I Want a New Drug" is a song by American rock band Huey Lewis and the News from their third album Sports. It was released as the second single from the album, following the top-ten hit "Heart and Soul" in January 1984. The single reached number six on the U.S. Billboard Hot 100 and topped the Dance Club Play chart. The song, a love song where the word "drug" is purposely left as an open-ended meaning to the listener, became one of the signature songs for the band. According to Lewis, he wrote the song in only a few minutes. "I was on the way to my attorney's house and I thought of it in the car. I pulled up and walked in. I said, 'Bob, give me a piece of paper, I've got to write this down'." According to Lewis, the song is a love song, and the meaning of the word "drug" in the song was purposely open ended. "It's really a love song. It's not a pro-drug song, it's not really even an anti-drug song. The word drug sort of gets your attention. But I think in love relationships there's more than 'I want you' or 'I need you' kind of thing." Lewis believed the definition of love was very open to interpretation depending on the listener. "I think real love contains humor and anger and confusion, all of those things." Three versions of the song were released. The album version had two extensive guitar solos both in the middle of the song and as a fade out, the single edit eliminated the first solo and brought the song to a cold-sustained end before the second (as in the song stops on the note before the second solo would have begun and holds it in a fade out). The single version is used in the music video and was the one spoofed by "Weird Al" Yankovic as "I Want a New Duck" (the aforementioned cold-sustained ending note fade-out is augmented by sounds of ducks quacking, plus instead of horns in the middle part and end, synthesized quacking is used instead). In addition, there exists a special dance mix which strips down the instrumental, giving the song a more "electronic" feel. This version extends the song to five minutes and 32 seconds. The video echoes the song's origin, with Lewis waking up late, remembering he has a concert that night, and racing across San Francisco using his yellow convertible, The San Francisco ferry, and a chartered helicopter to get to the concert on time, sighting a girl twice on his way, and finding her in the front row at the concert (the same girl is featured in the video for "Heart and Soul"). 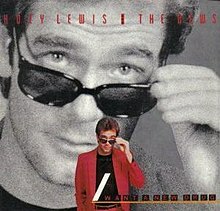 The video features Lewis's most famous outfit, a red sport jacket and pants with a plain black T-shirt and matching sunglasses (the man who takes the jacket and shades off Lewis before he goes on stage is the band's manager, Bob Brown). The woman in the video is played by actress Signy Coleman, whose mom was friends with Lewis's mom. Coleman also appears in the music video for "Heart and Soul". According to Lewis, one of the reasons the band agreed on doing the music video was to avoid a literal translation of the song and its lyrics. "The song [...] is not about drugs. It's a love song. The only way to avoid that was to sort of do 'a day in the life', which is what [the video] is." When the theme song of the 1984 film Ghostbusters was released, Huey Lewis sued Ray Parker Jr. for copyright infringement, claiming that Parker had stolen the melody from "I Want a New Drug". Lewis had been approached to compose the main theme song for the film, but had to decline because of his work on the soundtrack for Back to the Future. The two parties settled out of court. Details of the settlement (specifically, that Columbia Pictures paid Lewis a settlement) were confidential until 2001, when Lewis commented on the payment in an episode of VH1's Behind the Music. Parker subsequently sued Lewis for breaching confidentiality. ^ Greene, Andy (May 17, 2013). "Huey Lewis on 30 Years of 'Sports': 'Our 15 Minutes Were a Real 15 Minutes'". Rolling Stone. Retrieved October 22, 2013. ^ Vanhorn, Teri (March 23, 2001). "Ray Parker Jr. Suing Huey Lewis Over ‘Ghostbusters’ Comment". MTV. ^ Kent, David (1993). Australian Chart Book 1970-1992 (illustrated ed.). St Ives, N.S.W. : Australian Chart Book. p. 91. ISBN 0-646-11917-6. ^ "CHART NUMBER 1418 – Saturday, March 10, 1984". Archived from the original on 7 November 2006. Retrieved 2016-04-23. CS1 maint: BOT: original-url status unknown (link). CHUM. Retrieved April 23, 2016. ^ "Top Singles - Volume 40, No. 3, Mar 24, 1984". RPM. Retrieved April 23, 2016. ^ "Charts.nz – Huey Lewis and the News – I Want a New Drug". Top 40 Singles. Retrieved April 23, 2016. ^ a b c "Huey Lewis – Awards". AllMusic. All Media Network. Retrieved April 23, 2016. ^ "CASH BOX Top 100 Singles – Week ending MARCH 31, 1984". Cash Box magazine. Retrieved April 23, 2016. ^ "Offiziellecharts.de – Huey Lewis and the News – I Want a New Drug". GfK Entertainment Charts. Retrieved March 14, 2019. ^ "Top 100 Singles of 1984". RPM. Retrieved April 23, 2016. ^ "Top Pop Singles". Billboard. Nielsen Business Media, Inc. 96 (51): 5. December 22, 1984. ISSN 0006-2510. Retrieved April 23, 2016. ^ "Top Dance Singles/Albums". Billboard. Nielsen Business Media, Inc. 96 (51): 13. December 22, 1984. ISSN 0006-2510. Retrieved April 23, 2016. ^ "The CASH BOX Year-End Charts: 1984". Cash Box magazine. Archived from the original on April 2, 2015. Retrieved April 23, 2016. ^ "Canadian single certifications – Huey Lewis & the News – I Want a New Drug". Music Canada. Retrieved April 21, 2016. ^ "American single certifications – Huey Lewis & the News – I Want a New Drug". Recording Industry Association of America. Retrieved April 21, 2016. If necessary, click Advanced, then click Format, then select Single, then click SEARCH. This page was last edited on 25 March 2019, at 11:44 (UTC).